Posted by Brittany Bosher on Wednesday, December 23rd, 2015 at 12:05pm. 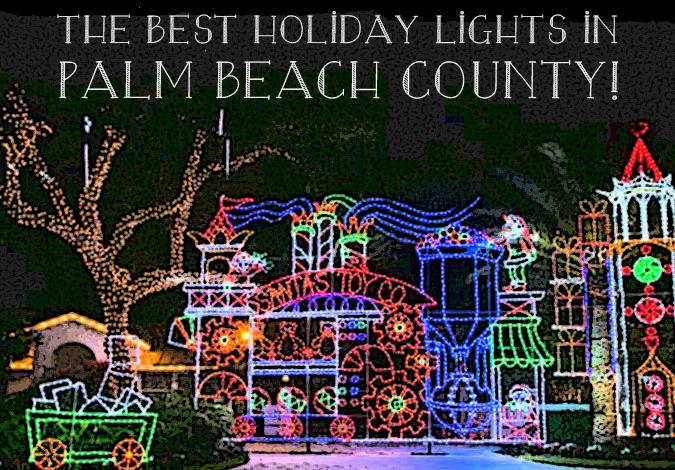 Snug Harbor in Palm Beach Gardens- This year, the famous lights of Snug Harbor are coming back after a break from last year. Even more lights will light up the beautiful homes and all of the trees that line the neighborhood. Organized by John Staluppi, Snug Harbor has become one of the most recognized holiday destinations to see lights in south Florida. Directions: Take I-95 to PGA Boulevard, go east to Prosperity Farms Road and go north. Snug Harbor will be on your right. The Heights in Jupiter- The homes in the quaint, yet large neighborhood of the Heights are decorated with hundreds of thousands of lights. Some of the streets you will want to see include Hollywood Street and Pompano Street. You will see flying Santa, gorgeous reindeer and so much more. Directions: Take I-95 to Donald Ross Road and go east. Get in the left-hand lane immediately so you can turn left onto Heights Boulevard at the light. Follow the road about a mile and look to your left. You can turn down just about any street, but don’t miss Hollywood. Directions: I-95 to Indiantown Road, go east. Turn right on Central Boulevard, left on Toney Penna Drive, take the third right on Jupiter Village Road, take the first left on Greentree Circle, then right on Woodbridge Drive. Directions: Take I-95 to Indiantown and go east to MilitaryTrail. Turn right, go past Tony Penna Drive and south one block and turn right on Oak Terrace. Gabriel Lane in Lake Clark Shores- Gabriel Lane is a beautiful, quiet street in the community of Lake Clark Shores that transforms during the holidays. It is truly a wonder to see all of the dazzling lights and decorations. Get there early so you can park and walk the street with your family. Directions: I-95 to Forest Hill Boulevard. West to Florida Mango Road. Turn right, and Gabriel is about a mile and a half on the right, just south of Meadow Park Elementary School. The 5600 block of Flagler Drive in West Palm Beach- At this house, the lights jump over Flagler and continue out to the boat dock on the Intracoastal with the brightest green and red lights you’ve ever seen. Directions: I-95 to Southern Boulevard, east to FlaglerDrive and turn right, right before the Southern Boulevard bridge. Directions: Take Military Trail south to approximately 1mile past Hypoluxo Road, make a right on Canal road, follow to the end, make a left and the house is 1 block on the left-hand corner. Directions: Take Lake Worth Road west past the Turnpike andturn right on Blanchette Trail. Go to the sixth street, Pinion, and turn right. Look for the big candy cane. Go all the way to the end.